During any visit to Costa Rica you will become familiar with the phrase “Pura Vida” or “Pure Life.” Catchy, but what does it mean really? We decided to take the “Costa Rica Pura Vida Experience” tour to find out. 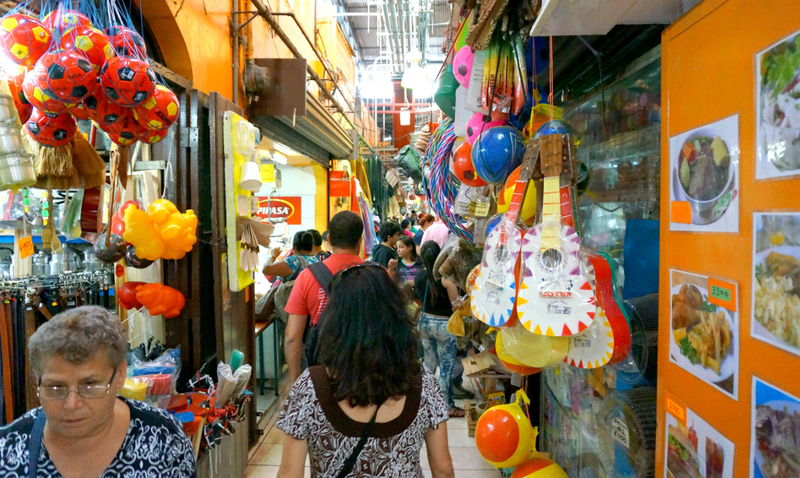 It combines a walking and cultural tour, food tastings, and …. a masquerade. Who could resist? It starts off with a walking tour of San Jose. The downtown has a pedestrian street that includes several local markets. After passing through the entrance you’ll find a maze of small shops selling anything from produce and herbs to live chickens and hardware. The prices were better than we had seen in the larger supermarkets, and the shops were owned by families who pass ownership of the stores and restaurants through the generations. We were lucky enough to visit during the Christmas season when the local cafes had tamales. These little intimate eateries, called Sodas, usually have a limited selection featuring a plate of the day. 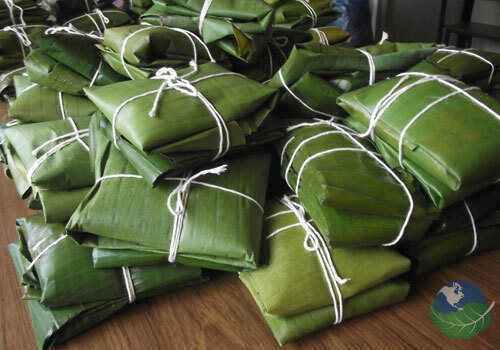 The Costa Rican version of this holiday treat (a corn meal mixture stuffed with meat or vegetables) is made wrapped in a banana leaf rather than a corn husk (in the Mexican version) and then boiled. Neighbors gather together before Christmas and work as a team over the course of 2 days, and the result is well worth the effort. While there we also sampled some of the famous Costa Rican Coffee. You can’t miss the sweet aroma of fresh coffee roasting as you stroll through the market. The taste is very smooth and full flavored without being overly bitter. The owner of the eatery chatted away with us along with diners at the next table. Condiments are shared among the tables and often people will grab a chair wherever there is a spot available. It was easy to get swept up in the festive chaotic atmosphere as we enjoyed our treats. 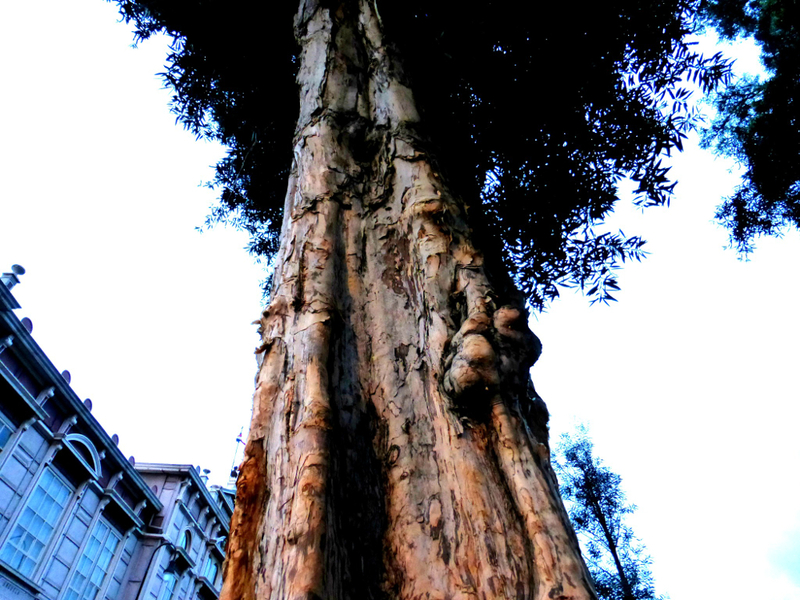 We finished up and then wandered around the downtown area, where we took in a variety of sights including cork trees growing in the park, beautiful buildings that were was once the homes of wealthy plantation owners, and a large selection of bronze statues and artwork that are sprinkled throughout the city. Lunch was served up in another local Soda in a small adobe building that had been standing for over 100 years. The “pupusa” was the crowd favorite. 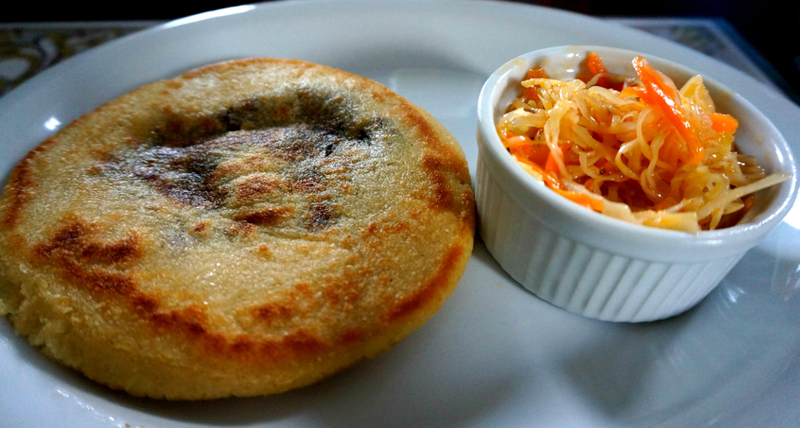 Pupusa is a savory light corn pancake stuffed with a meat, such as chicken or pork. You split the pancake open and spread the accompanying fresh vinegary slaw inside and enjoy. We also sampled Chifrijo. 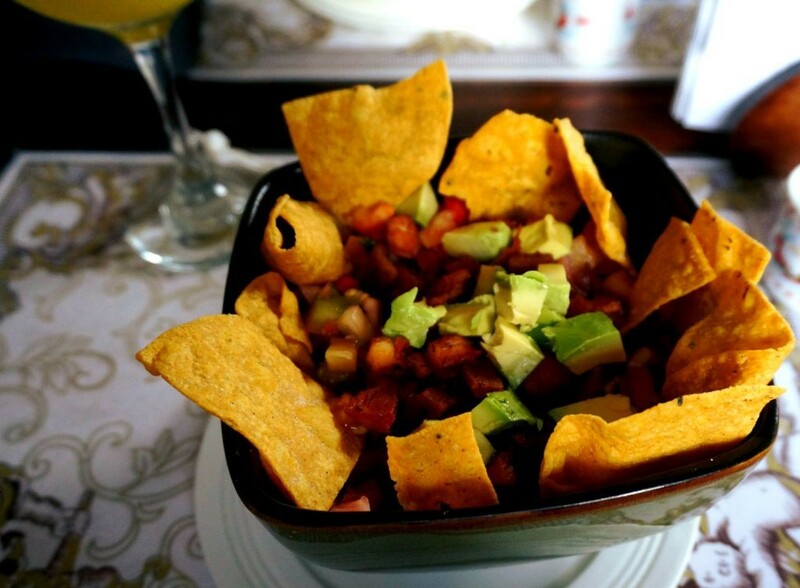 This layered dish has a base of rice and beans combined with crispy pork (chicharones) and avocado slices, topped with a chimichurri sauce, in this case a tomato-based salad with lime juice, and is served with tortilla chips for scooping. Both dishes we tasted were simple, fresh, and outstanding. 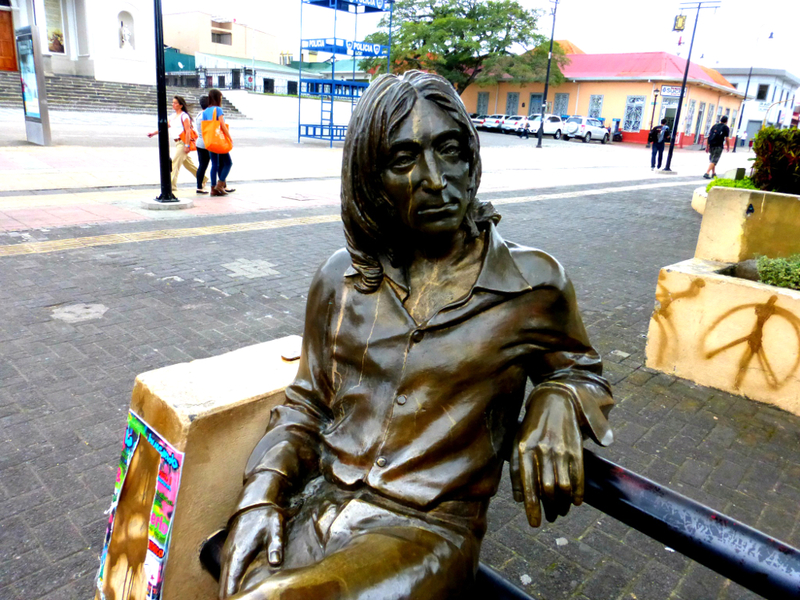 Our last stop was outside of the city center in the Escazu area – known as the place of witches. We wound along the narrow streets (once used for Ox carts) finding areas that more resembled the jungle for which Costa Rica is famous. Many of the men on the street had a machete hanging from their belts. Our guide quipped “In Costa Rica you are as likely to find someone without a machete as you are to find someone without a cell phone in New York City.” It is the jungle, after all. We pulled up to a small house and were greeted by a man with a huge grin on his face surrounded by giant colorful masks. 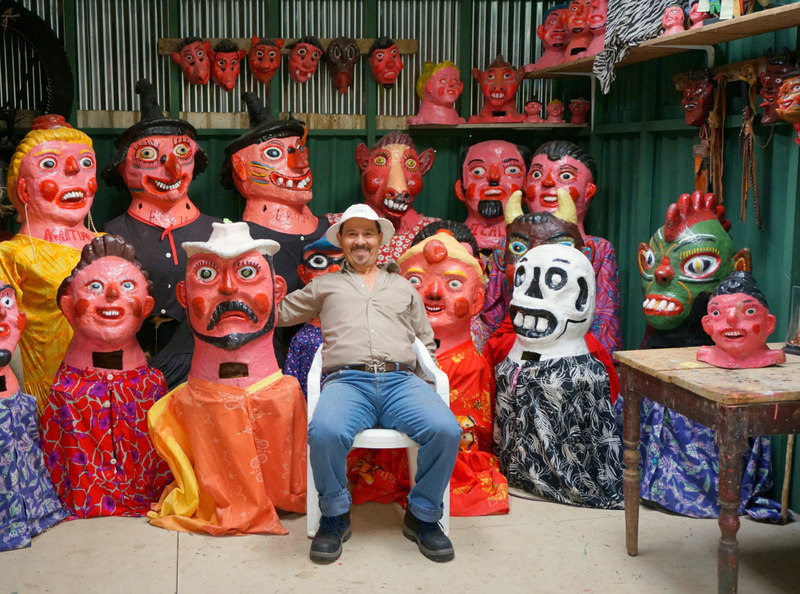 Gerardo Montoya is a second generation mascarero (mask-maker). The masks with brightly colored clothing are worn by a mantudo (masked one covered in a blanket), to dance in parades and celebrations throughout Costa Rica. Gerardo’s masks were almost as colorful as the man himself. He showed us our creations, inspired by his visions and people within his community, because he said it gave him joy to make them and happiness to everyone who saw them. We were treated to a demonstration and then donned our own masks and joined in the fun. So when you look up what the definition of Pura Vida is, you’ll find a synonymous saying. “Life is wonderful, enjoy it.” And today, I did. Thank you to Urban Adventures San Jose for providing this experience! Our opinions and our comments are our own. 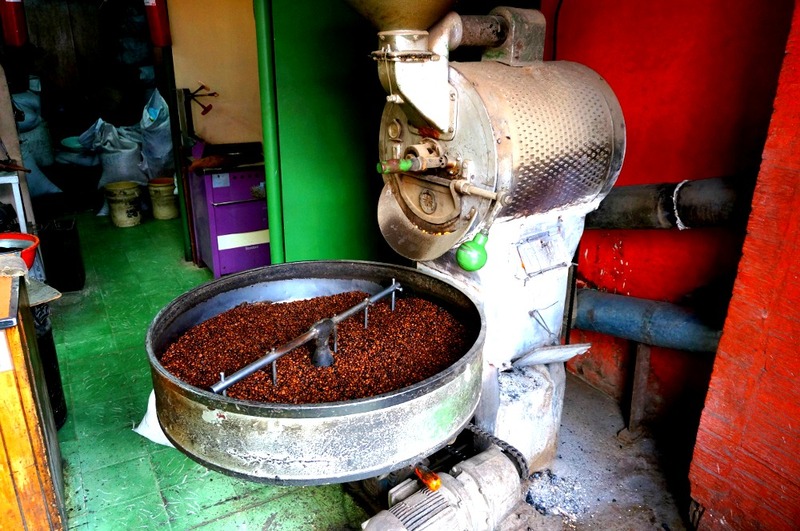 You had me at traditional coffee roasting! Honestly, Costa Rica looks amazing and I can’t wait to make a visit. The coffee was amazing! And cheap, especially compared to everything else in CR. I’ve been in Costa Rica for 3 weeks now but have been avoiding San Jose. 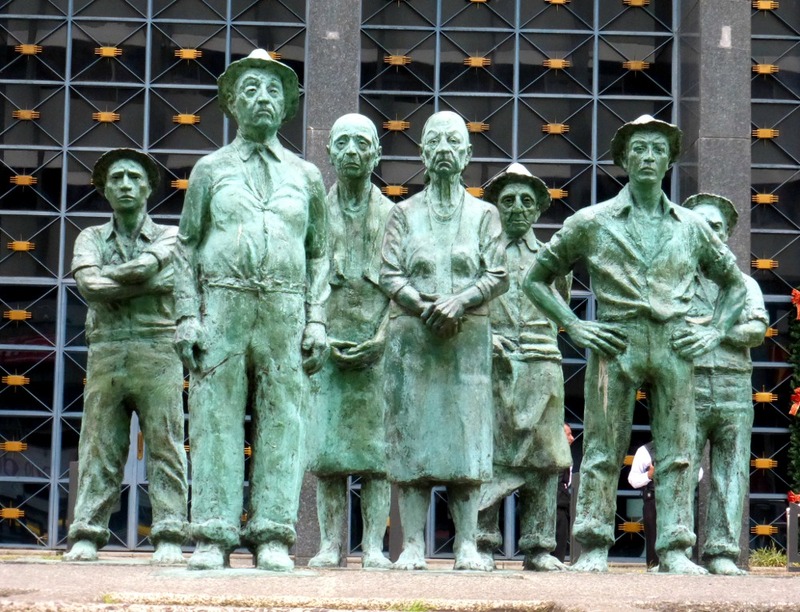 But this makes me almost resent that decision – you just showed me a side of San Jose I wasn’t aware of! The rest of the country is beautiful as well, but San Jose has some definite things to offer! Plus, we found it easier to get get good, traditional food in the city. Oh my . . . I would kill to try some of that Chifrijo right now. It looks and sounds phenomenal! 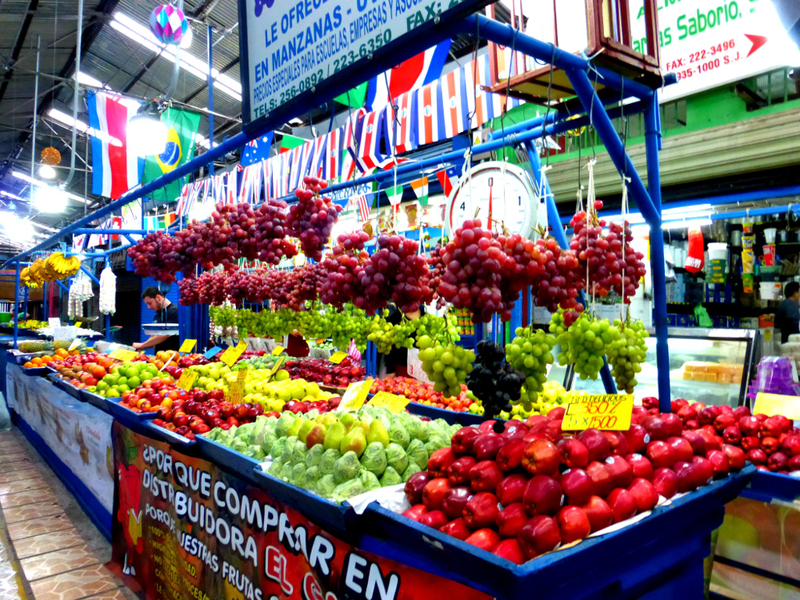 That fruit market looks amazing. And I love tamales during Christmas season. I have many friends who do the corn-husk tamales and some who do banana leaf tamales. I love both! I agree – both types of tamale are good but different. We almost got the opportunity to make the banana leaf tamales when we were in Costa Rica – maybe next time. 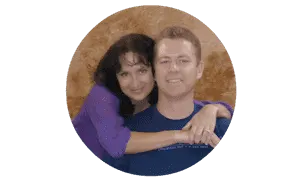 The process sounds like a wonderful community event that I would love to take part in. Great post! Funny thing is after 5 years living there I dont think I explored the city as much as you did:) I stuck with nature and beaches but wish I hung out in San Jose more! Thanks for the comment! It was really nice to be able to connect with Eric from Urban Adventurers San Jose – he really showed us things I don’t think we would have found on our own. It was the first papusa we have tried, so we can’t compare them to El Salvador’s, but it was delicious! Masks are great! I always enjoy local folklore! About the Pura Vida – isn’t it a little similar to “slow life” – simply enjoying every moment of it? (something that European forgot long time ago…)?